The tour includes the arrival in the afternoon and accommodation in hotel. Free choice for dinner (not included). 1. Private transfer in the Langhe area for a traditional Piedmontese lunch. In the afternoon, there will be a tasting of different types of wines in a historic winery of the chosen area. 2. Private Transfer in Monferrato for the famous truffle hunting and tasting of local products with truffles all day long. 3. Private transfer in Monferrato for the visit to the Martini factory and tasting. In the afternoon, there will be a tasting of different types of wines in a historic winery of the chosen area. Free day to visit the historical centre of Turin, just a short walk away from your hotel. Truffle hunter from October to June. Additional for double room in single use. 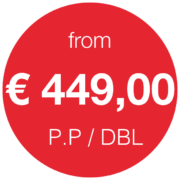 2 overnights accommodation in 3 o 4 star hotel from € 449,00.